Download "Department of Mathematics and Computer Sciences"
1 Department of Mathematics and Computer Sciences DEGREES Learning Technologies (MS) Instructional Design and Technology (MS) CERTIFICATES Learning Technologies Virtual Worlds in Education Instructional Design and Technology The Department of Mathematics and Computer Science offers the following online graduate degrees. 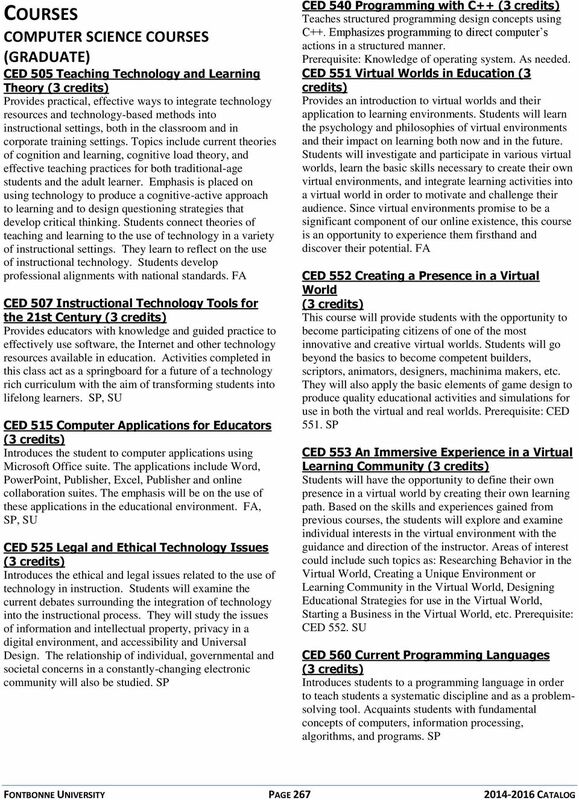 Both are fully accredited by the Higher Learning Commission (HLC): A master of science degree in Learning Technologies A master of science degree in Instructional Design and Technology Graduate Certificate Programs (all online): Learning Technologies Virtual Worlds in Education Instructional Design and Technology APPLICATION Information and application materials may be obtained by contacting: Ms. Cheryl Burrus, administrative assistant at or or Dr. Mary Abkemeier, chair of the department and Director of the MS programs in Learning Technologies and Instructional Design and Technology at or ADMISSION For detailed information on university admission policies and regulations, please refer to the graduate program information section in this catalog. In addition: A minimum undergraduate GPA of 3.0 on a 4.0 scale is required for full acceptance. Others may be admitted on probationary status pending demonstration of ability to perform quality work at the graduate level. Three letters of recommendation, one of which is from a supervisor or recent academic advisor, are required. 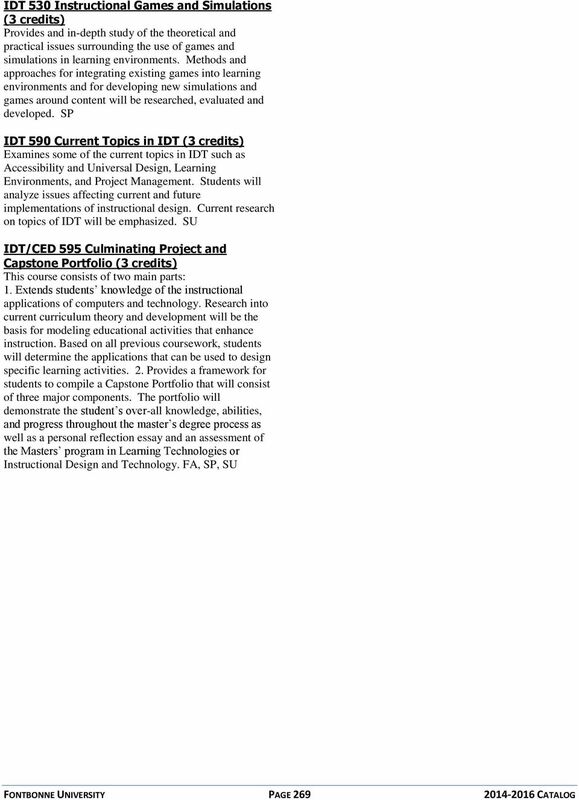 If this is not possible, please contact the director of the Master of Science degree program in Learning Technologies. 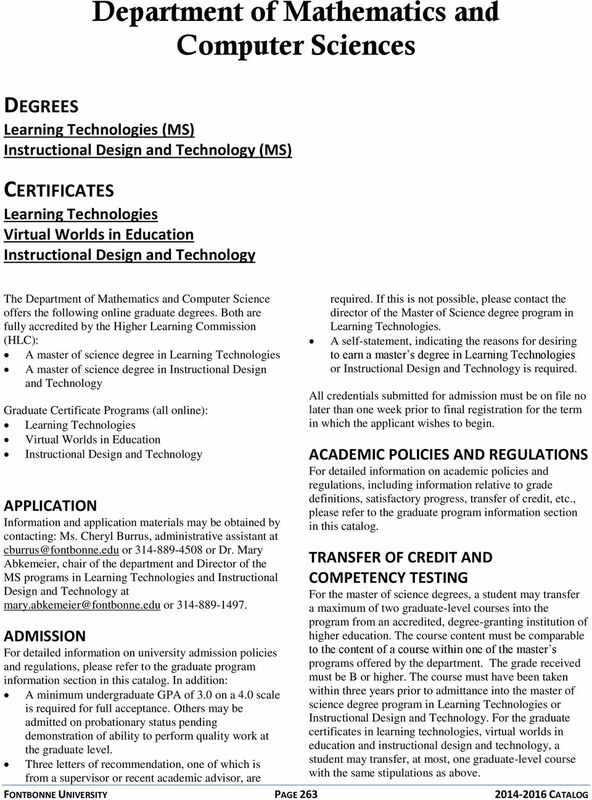 A self-statement, indicating the reasons for desiring to earn a master s degree in Learning Technologies or Instructional Design and Technology is required. FONTBONNE UNIVERSITY PAGE CATALOG All credentials submitted for admission must be on file no later than one week prior to final registration for the term in which the applicant wishes to begin. ACADEMIC POLICIES AND REGULATIONS For detailed information on academic policies and regulations, including information relative to grade definitions, satisfactory progress, transfer of credit, etc., please refer to the graduate program information section in this catalog. TRANSFER OF CREDIT AND COMPETENCY TESTING For the master of science degrees, a student may transfer a maximum of two graduate-level courses into the program from an accredited, degree-granting institution of higher education. 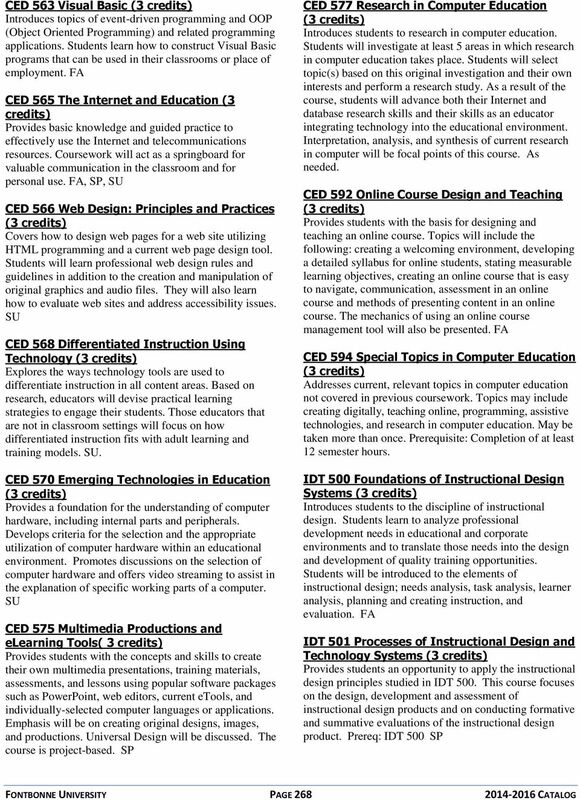 The course content must be comparable to the content of a course within one of the master s programs offered by the department. The grade received must be B or higher. 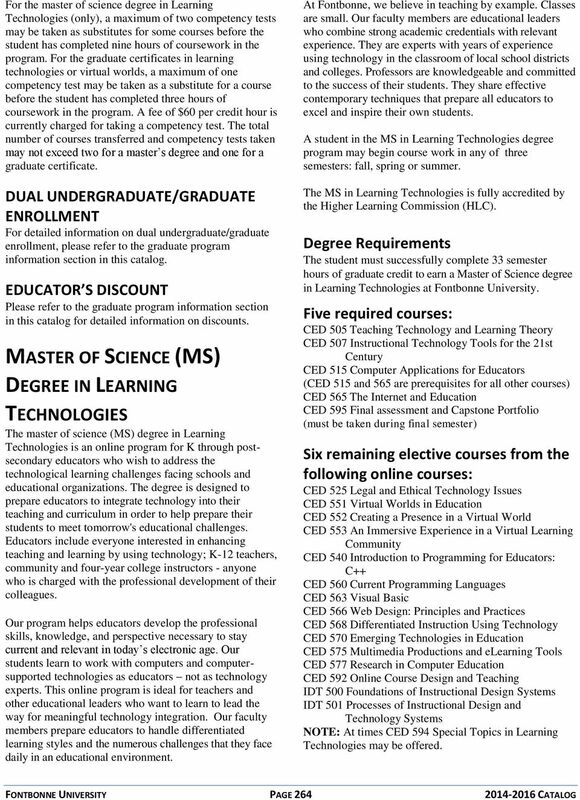 The course must have been taken within three years prior to admittance into the master of science degree program in Learning Technologies or Instructional Design and Technology. 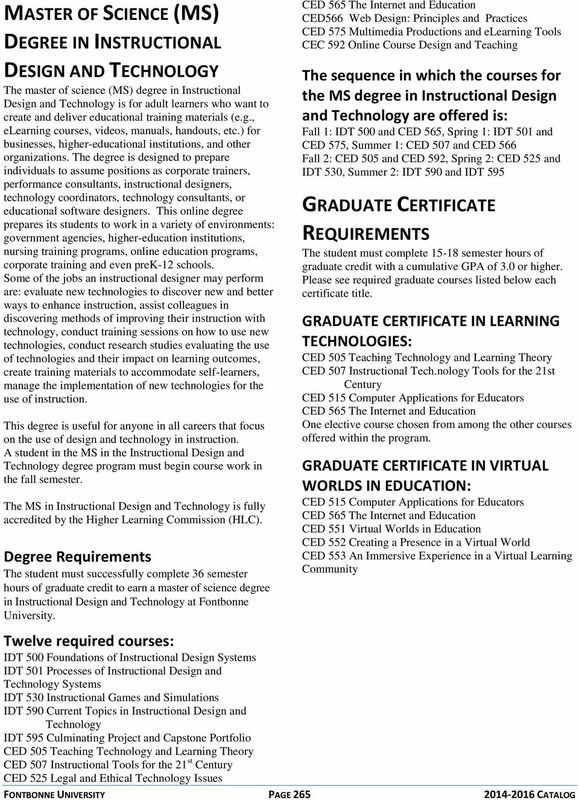 For the graduate certificates in learning technologies, virtual worlds in education and instructional design and technology, a student may transfer, at most, one graduate-level course with the same stipulations as above. The field of computing enables much of the on-going revolution in information technology and communications. Its techniques, tools and problem-solving approaches have proven most powerful and effective. COLLEGE OF THE ARTS Dr. John Gaston, Dean Radio House, 230 Brookwood Drive Department of Art: Mr. A. Blake Pearce, Head Department of Communication Arts: Dr. Carl Cates, Head Department of Music: Dr. C.